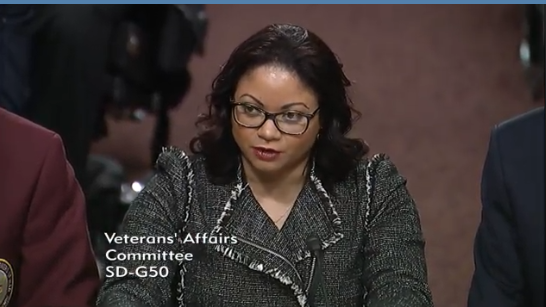 WASHINGTON, DC (March 6, 2018) – The changing face of the American veteran and how Congress can address their pressing needs in a time of war were the subjects of powerful testimony today by Melissa Bryant, Iraq War veteran and Chief Policy Officer for Iraq and Afghanistan Veterans of America (IAVA), before the combined House and Senate Veterans Affairs Committee. Originally from Philadelphia, Bryant is the daughter of a Vietnam veteran and the granddaughter of a World War Two soldier killed in action, and her urgent testimony formally introduced IAVA’s “Big 6” 2018 advocacy priorities centering on the issues most important to our over 425,000 members. At a time of unprecedented politicization of veterans and military by political leaders across the aisle, and tremendous controversy inside the VA, the landmark “Big 6” initiative is IAVA’s biggest and boldest advocacy campaign ever, centering veterans voices and empowering them to lead the nation forward. The Big 6 is an urgent call to Congress, the White House, and all Americans to stand with IAVA now to tackle veteran suicide, support women vets, defend the GI Bill, invest in and protect VA and DoD reform, sound the alarm on burn pits and empower veterans to utilize medical cannabis. Bryant’s important testimony can be found on video here (Bryant’s remarks begin at 1:02:10). The full text of the testimony can be found here. IAVA’s Annual Policy Agenda: IAVA leverages the vast data from our Annual Member Survey to shape a comprehensive, non-partisan policy agenda that is shared online and is distributed to members of Congress. The policy agenda can be found and downloaded from www.iava.org/advocacy.